Egypt is on the knife edge between plunging into Algeria-style faction-fighting between secularists and Muslim fundamentalists, and finding a graceful way for its elected president to climb down from his more extreme assertions of power and privilege vis-a-vis the other branches of government. The toll from fighting in Egypt between pro- and anti-Morsi activists all over Egypt was 2 dead, 451 wounded (160 or so police) and about 250 people were arrested on Sunday. (Most of the arrestees were from Muhammad Mahmoud St. off Tahrir Square in downtown Cairo. A member of the New Left April 6 youth, Gabir Salah, who was shot in the head five days ago during clashes with security forced at Tahrir Square, died on Sunday; and a teenager who belonged to the youth wing of the Muslim Brotherhood was killed in clashes with protesters in the provincial city of Damanhour. Clashes and back and forth fighting continued all day Sunday in the Tahrir area, and the number of people camping out in tents increased. Morsi’s decree, limiting the power of the courts to intervene in the Constituent Assembly that is writing the new constitution, or in the decisions of the president and the upper house of parliament, continued to be poorly received by key organizations. Six further members of the originally 100-member constitution-drafting body resigned over the weekend, citing opposition to the presidential executive order. Altogether, of an original 100 members, 22 have resigned and another 7 reserve members have stepped down. The assembly has lost the participation of the liberal Ghad (Tomorrow) Party, of the leftist April 6 movement, and of a number of other left-liberal or Christian members. Many complained of being excluded by the Muslim Brotherhood members from key subcommittees. Constituent Assembly chair Hossam al-Ghariany insists that the body will finish its work by the end of the year, predicting that this completion of their task will restore social peace (seems to me that depends on what is in the final constitution). Even the chairman of the Egyptian senate or Shura Council, Ahmad Fahmi, has spoken out against Morsi’s decree. The protest came as a surprise, since Fahmi is a member of the Freedom and Justice Party that Morsi represents, and is a relative of the president. This development seems to me positive, since perhaps Fahmi and the Shura Council can meet with Morsi and get him to back down on some of the extravagant language in his decree. Morsi said Sunday that he would not back down from his executive order, but that it was temporary and was meant only to move the country forward. The opposition (liberals, leftists, secularists, Christians and Muslim traditionalists) does not appear to be impressed. He is meeting on Monday with the justices of the Supreme Judicial Council along with his Justice Minister, Ahmad Makki, who also has expressed reservations about Morsi’s declaration. The Egyptian stock market nearly fainted at the news of Morsi’s self-aggrandizing declaration of vast powers last Thursday and the street fighting and demonstrations that erupted in its aftermath. It plunged nearly ten percent on Sunday, losing about $4.5 billion. I should think the business community (including the Muslim Brotherhood big businessmen) will put pressure on Morsi to move quickly to restore confidence. The courts closed in Alexandria and in the entire province of Qalyubiya. A slowdown was announced in Asyut in Upper Egypt, and some partial closings were staged around the country by oppositionist attorneys and judges. The Lawyers’ Syndicate condemned Morsi for his decree. Egyptian journalists threatened a general strike. Fighting took place all day Sunday and continued on Monday morning in the western Delta city of Damanhour (pop. 250,000), a 15-year-old young man, Islam Masoud, was killed and 60 people were wounded when an angry assemblage attacked the Muslim Brotherhood HQ. There was open street fighting, with police nowhere to be seen. 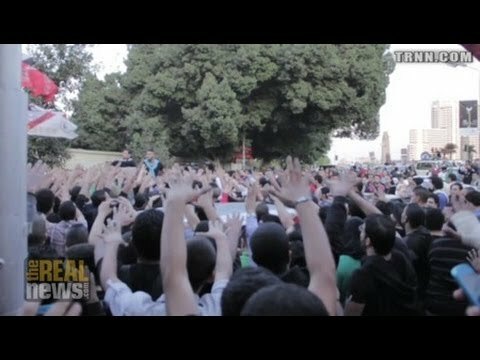 Anti-Morsi protesters are said to have set fire to the HQ of the railway police and to have cut rail service through the city between Alexandria and Cairo. The death of Islam Masoud further inflamed passions in the divided city. Late Sunday, it is alleged by secularists that interior ministry forces intervened, acting alongside a Muslim Brotherhood paramilitary. In the Delta city of Tanta (pop. 500,000), famed for its Sufi shrine, dozens of people on each side were wounded in clashes between opponents of Morsi’s decrees and Muslim Brothers on Sunday. After evening prayers, 8 people were wounded when protesting, and rumors spread that the Muslim Brothers had captured some protesters and were imprisoning them in the HQ of their Freedom and Justice Party. (The Brotherhood maintains that these individuals were throwing molotov cocktails and intended to burn the building down) A big crowd of hundreds then gathered to rescue them, throwing stones at the HQ. The Brotherhood is accused of loosing teargas on them. In the ensuing clash, dozens of people were hurt badly enough to go to hospital. Some of those attacking the MB HQ were members of the secular Wafd Party, others were alleged to be former members of the dissolved National Democratic Party of deposed dictator Hosni Mubarak. I suspect that some of the Muslim protesters were traditionalists who honor the Sufi saints (Muslim fundamentalists, like Christian Protestants, often disapprove of the idea of mediation between the individual and God). The police finally came and made some arrests.